The global maritime industry (one segment of the large transportation business) has an influence on many other industries worldwide, which are reliant on maritime trade to transport goods and raw materials. According to Koncept Analytics, the maritime industry is the leading transport sector in terms of size. Huge capital is required to support the global shipping sector. The industry also relies on a vast workforce and technology innovation. Global economic growth fuelling global trade is the main factor affecting the shipping industry. While traditionally the EU region has dominated the shipping sector, there has been a shift in recent years by which Asia has overtaken Europe. The Middle East shipbuilding and repairing industry witnessed the least impact from the global financial crisis, reports Global Industry Analysts. The Arabian Gulf weathered the recession better than other regions to now boast the world’s most active ports and yards. There are currently more than 2,000 vessels undergoing repair work in Middle Eastern ports. The region shows good resilience due to its evolving marine transport industry, particularly in Dubai and Abu Dhabi. The past decade has seen Korea and China emerge to take the top spot in the global shipbuilding industry. Japan is ranked third among the world’s leading shipbuilding regions, having been overtaken by South Korea between 1999 and 2000. China more recently overtook Korea to be the global leader. The US represents the world’s largest cruise sector, with the UK and Germany coming next, reports KeyNote. However, the EU region has been overtaking North America in terms of cruise passenger numbers. Germany is the world’s fastest-growing passenger transport market. Research shows cruises to be popular with 55 to 64-year-olds, though this age group is expected to decline through 2015. The consumer base aged between 65 and 74, however, is set to climb. The cruise market is currently witnessing a trend for preference for larger ships. This is advantageous to cruise lines as they can cut costs per passenger by increasing capacity. Consumers are also more likely to spend onboard on larger ships than onshore as there are more services and amenities available to them. Royal Caribbean runs the largest ships, with two 225,250-tonne ships that have a capacity of 5,400 passengers. More than 20 new cruise liners are to be introduced to the global fleet between 2012 and 2016. Most of these cruise liners have passenger capacity in excess of 3,000. Though recording strong growth, the cruise market is in danger of oversaturation, which could result in mass discounting in a bid to encourage demand. Maritime containerization allows the transit of goods through a highly automated system. Shipping containers cut transportation costs and facilitate global trade. Maritime transportation industry performance is dictated by global demand for goods. Global Industry Analysts predicts the global maritime containerization market will exceed 730 million TEUs before the close to 2017. Market growth will be fuelled by growing sea trade, investing in port terminal facilities, evolution in shipping networks and the rising frequency of maritime freight transport worldwide. Technology will continue to play a pivotal role in the industry, with innovations such as automated container handling, self-unloading of ships, operational efficiency and higher speed. Market performance will also be driven by demand in Asia for oil and liquefied natural gas. Russia’s maritime transport industry has grown in recent years, following a fall in 2006. IndexBox reports the country’s freight transportation by sea exceeded 110% in 2007, reached 125% in 2008 and fell to just more than 105% in 2009. 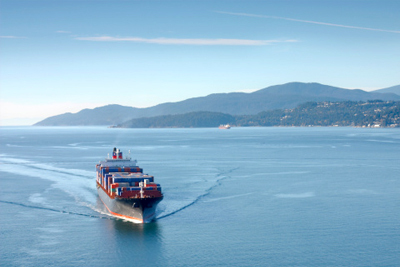 In 2010, more than 40 million tons of goods were transported by sea. China’s port industry climbed steeply in 2010 after the 2009 downturn. Research in China reports almost 9 billion tons of cargo passed through Chinese ports in 2010, representing a 17% year-on-year increase. Meanwhile container throughput exceeded 145 million TEUs, accounting for a 19% increase compared with 2009. Shanghai’s port container throughput exceeded 29 million TEUs, taking the world’s top-spot in terms of container throughput. Korea and China lead the global shipbuilding industry. Korean company Samsung Heavy Industries filed more than 1,000 patent applications in 2010, reports Global Industry Analysts. Shipyards in developing countries such as Vietnam, India, Malaysia and Brazil represent an emerging trend in recent years. There is also increasing demand for shipping outfits to invest in shipyards to have some involvement in the supply chain.